Mere House was originally a late-18th century informal park and lake associated with the rectory created in 1780. The 6-acre garden has been renewed since 1958. 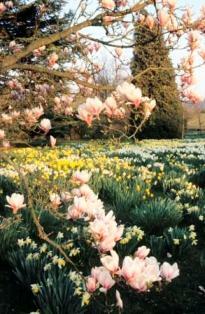 The main features are specimen trees, shrubs and extensive spring bulbs. There are various park and lake walks. Many trees were blown down in the storm on 16 October 1987, and in January 1990.The lake was created in 1780 by canalising a stream feeding the Mereworth Castle lakes and bunds have been built to its south and west to mitigate increasing road noise and development. Most of the larger trees were planted before 1850. Most of the beds, ornamental trees and shrubs date from 1958, with an emphasis on foliage contrast. The weeping ash by the croquet lawn and the extensive Viburnum tomentosum plicatum beyond it were planted 30 years ago, and the garden contains several varieties of ornamental elder. There is an extensive display of snowdrops in early spring followed by a magnificent carpet of daffodils. In the autumn a wide spread of colour is provided by liquidambar, nyssa sylvatica, parrotia and contrasting conifers and evergreen shrubs. The garden is open for group visits (ten or more people) by appointment at any time of the year, as well as under the National Gardens Scheme on selected days.